Graph last updated on 28 Jan, 2014. 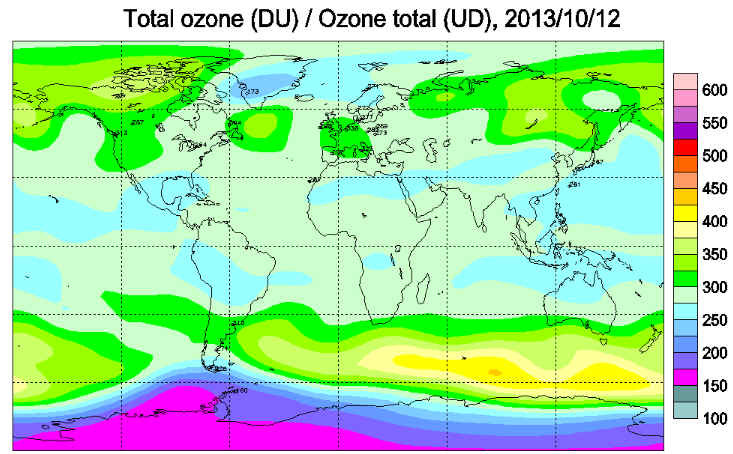 The size of the ozone hole is the area on the globe in million square km of ozone column values below 220 DU. Note that the Antarctic continent is about 14 million km², the USA is just over 9 million km², Italy is about 0.3 million km², and The Netherlands only 0.04 million km². 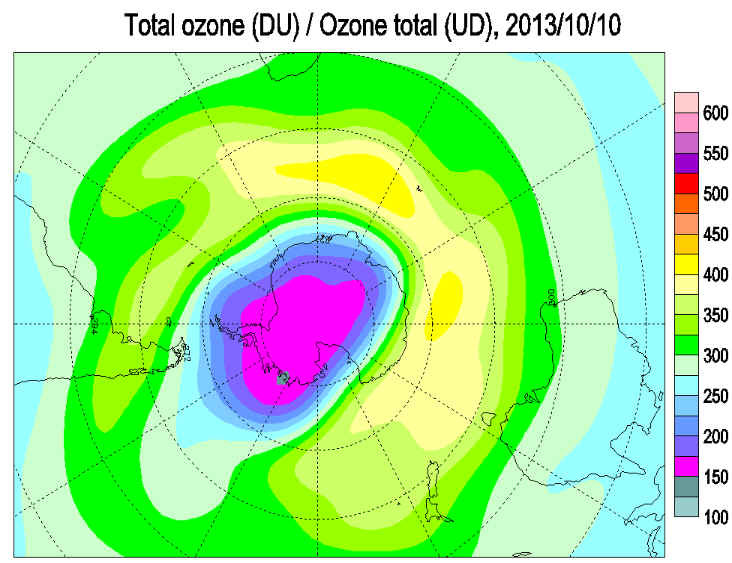 The 2013 ozone hole is over. The temperature of the lower ozone layer rose rapidly in a "Spring warming event" in late October and Polar Stratospheric Clouds (PSCs) are no longer present within the polar vortex. The ozone layer temperature dropped below -90°C on occasion during the late winter. On a few days in early August, in mid and late September new record minima were set. It was significantly cooler than the long term mean until late August, and generally remained colder than the long term mean until mid October. The area with temperatures colder than the PSC formation temperature of -78°C was around average until mid September, reaching a broad peak of around 25 million square kilometres from mid July to late August. The area dropped below average in mid September, and declined to near zero by mid October, a little earlier than average. The Spring Warming pushed temperatures over the Antarctic Peninsula well above the long term average for the time of year. The 2013 winter polar vortex is well past its largest and was generally a little larger than the average over the last decade, reaching a peak of around 33 million square kilometres in late August. It covered around around 12 million square kilometres by mid November. According to NOAA SBUV measurements the ozone hole began to form in mid August and was at its largest at around 21 million square kilometres from mid to late September. The area of the hole had shrunk to zero by mid November. The hole was generally larger than in 2012, but smaller than the average of the last decade. It is an earlier end to the ozone hole than the average for the last decade. Higher ozone generally surrounds Antarctica from 55°S to 70°S in a broad ring, and average values cover much of the continent. Highest values, near 350 DU, are off Enderby Land. Lowest values, around 270 DU, are off the Pacific coast of Antarctica. The edge of the ozone hole briefly touched the tip of South America on September 16, October 12 and more extensively from October 15 to 17. On occasion atmospheric vertical motions create small areas with ozone substantially below the long term average. Different satellites give different views of the exact ozone distribution. The continent covers 14 million sq. km. 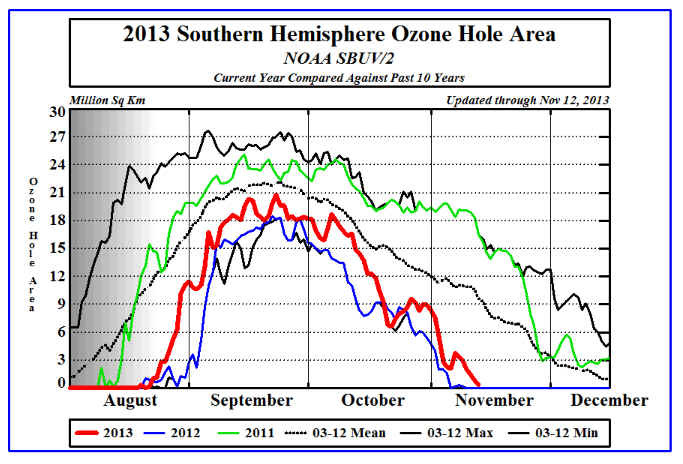 The 2013 ozone hole is nearly over. The temperature of the lower ozone layer is rapidly rising in a "Spring warming event" and Polar Stratospheric Clouds (PSCs) are no longer present within the polar vortex. The ozone layer temperature dropped below -90°C on occasion during the late winter. On a few days in early August, in mid and late September new record minima were set. It was significantly cooler than the long term mean until late August, and generally remained colder than the long term mean until mid October. The area with temperatures colder than the PSC formation temperature of -78°C was around average until mid September, reaching a broad peak of around 25 million square kilometres from mid July to late August. The area dropped below average in mid September, and declined to near zero by mid October, a little earlier than average. The 2013 winter polar vortex is past its largest and was generally a little larger than the average over the last decade, reaching a peak of around 33 million square kilometres in late August. It now covers around around 21 million square kilometres. According to NOAA SBUV measurements the ozone hole began to form in mid August and was at its largest at around 21 million square kilometres from mid to late September. It was generally larger than in 2012, but smaller than the average of the last decade. It is now around 2 million square kilometres in extent. This is similar to 2012, and close to the minimum over the last decade. Highest ozone values surround Antarctica at about 45 - 60°S in a horse-shoe between India, Australia, South America and Africa, with highest values near 400 DU. Lowest values, below 220 DU, are Enderby Land. The edge of the ozone hole briefly touched the tip of South America on September 16, October 12 and more extensively from October 15 to 17. On occasion atmospheric vertical motions create small areas with ozone substantially below the long term average. Different satellites give different views of the exact ozone distribution. The continent covers 14 million sq. km. The lower ozone layer is rapidly warming and Polar Stratospheric Clouds (PSCs) are no longer forming within the polar vortex, though they can still exist. 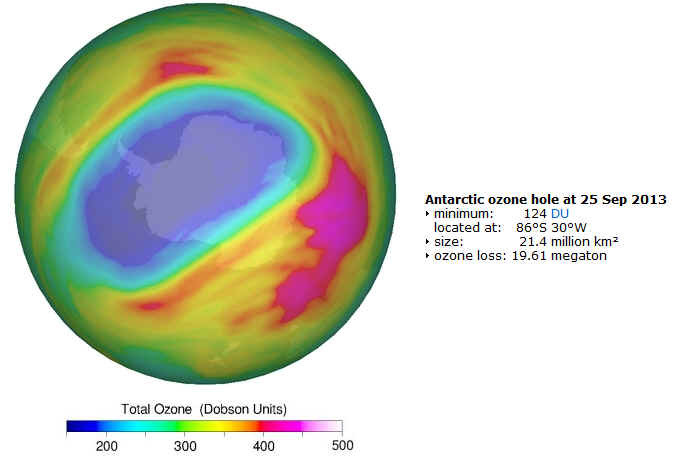 The 2013 ozone hole is well past its maximum depth and size. The ozone layer temperature dropped below -90°C on occasion during the late winter. On a few days in early August, in mid and late September new record minima were set. It was significantly cooler than the long term mean until late August, and generally remained colder than the long term mean until mid October. The area with temperatures colder than the PSC formation temperature of -78°C was around average until mid September, reaching a broad peak of around 25 million square kilometres from mid July to late August. The area dropped below average in mid September, and declined to near zero by mid October, a little earlier than average. The 2013 winter polar vortex is past its largest and was generally a little larger than the average over the last decade, reaching a peak of around 33 million square kilometres in late August. It now covers around around 21 million square kilometres. According to NOAA SBUV measurements the ozone hole began to form in mid August and was at its largest at around 21 million square kilometres from mid to late September. It was generally larger than in 2012, but smaller than the average of the last decade. It is now around 9 million square kilometres in extent. This is similar to 2012, and close to the minimum over the last decade. Highest ozone values surround Antarctica at about 45 - 60°S in a horse-shoe between Africa, Australia and South America, with highest values above 420 DU. Lowest values, below 170 DU, are over Dronning Maud Land. The edge of the ozone hole briefly touched the tip of South America on September 16, October 12 and more extensively from October 15 to 17. On occasion atmospheric vertical motions create small areas with ozone substantially below the long term average. Different satellites give different views of the exact ozone distribution. The continent covers 14 million sq. km. The lower ozone layer is rapidly warming and Polar Stratospheric Clouds (PSCs) are no longer forming within the polar vortex, though they can still exist. 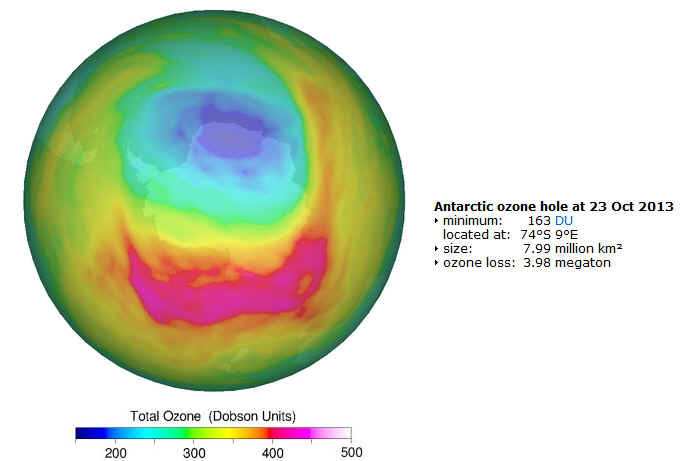 The 2013 ozone hole is well past its maximum depth and size. The ozone layer temperature dropped below -90°C on occasion during the late winter. On a few days in early August, in mid and late September new record minima were set. It was significantly cooler than the long term mean until late August, and generally remained colder than the long term mean until mid October. The area with temperatures colder than the PSC formation temperature of -78°C was around average until mid September, reaching a broad peak of around 25 million square kilometres from mid July to late August. The area dropped below average in mid September, and declined to near zero by mid October, a little earlier than average. The 2013 winter polar vortex is past its largest and was generally a little larger than the average over the last decade, reaching a peak of around 33 million square kilometres in late August. . According to NOAA SBUV measurements the ozone hole began to form in mid August and was at its largest at around 21 million square kilometres from mid to late September. It was generally larger than in 2012, but smaller than the average of the last decade. It is now around 9 million square kilometres in extent. This is similar to 2012, and close to the minimum over the last decade. Highest ozone values surround Antarctica at about 45 - 60°S in a horse-shoe between Africa, Australia and South America, with highest values above 400 DU. Lowest values, below 170 DU, are over Coates Land. The edge of the ozone hole briefly touched the tip of South America on September 16, October 12 and more extensively from October 15 to 17. On occasion atmospheric vertical motions create small areas with ozone substantially below the long term average. Different satellites give different views of the exact ozone distribution. The continent covers 14 million sq. km. The area of the annually recurring Antarctic ozone hole reached its peak at 24.0 million square kilometers on 16 September according to data from NASA. This is more than in 2012 and 2010, but less than in 2011. The World Meteorological Organization’s newest Antarctic Ozone Bulletin said the ozone hole area averaged over the ten last days of September was 20.9 million km2 (data from the Royal Netherlands Meteorological Institute, KMNI). The ozone mass deficit averaged over the same period was 19.59 megatonnes. This is more than in 2010 and 2012 but less than in 2011. As the temperatures rise after the southern hemisphere winter, the ozone depletion rate will slow down. 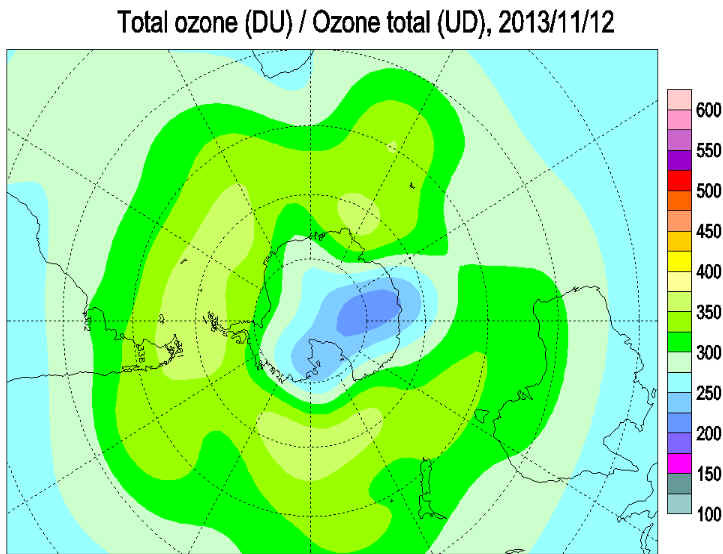 It is still too early to give a definitive statement about the degree of ozone loss that will occur in 2013. Existing data indicates that this year’s ozone hole is larger than in 2012 and possibly also 2010, but smaller than the one of 2011. The ozone bulletin is based on observations from the ground, weather balloons and satellites from WMO’s Global Atmosphere Watch Program and its network of scientific stations in some of the world’s most inhospitable terrain. Most stations reported clear signs of ozone depletion. For example, on 17 September, the ozone hole extended all the way to the southern tip of the South American continent and affected inhabited places such as Ushuaia and Río Gallegos, where Argentinian scientists carry out observations of the stratospheric ozone layer. Such episodes typically occur a handful of times each September-November. Especially in November, when the sun is high in the sky, they can lead to a significant increase in the intensity of solar ultraviolet radiation that hits the earth's surface. The meteorological conditions in the Antarctic stratosphere found during the austral winter (June-August) set the stage for the annually recurring ozone hole. The last ten days of September is typically the time period when the ozone hole reaches its maximum extent. By most criteria, the largest ozone hole was observed in 2006. An international agreement banning the worst ozone depleting substances has stemmed the destruction of the ozone layer. However, severe Antarctic ozone holes are expected to continue during the next couple of decades. The lower ozone layer is warming from its winter minimum temperature, which dropped below -90°C on occasion. It was significantly cooler than the long term mean until late August, and generally remains colder than the long term mean. Polar Stratospheric Clouds (PSCs) are still forming within the polar vortex. On a few days in early August, in mid and late September new record minima were set. The 2013 winter polar vortex is just past its largest and has generally been a little larger than the average over the last decade. It remains quite stable. According to NOAA SBUV measurements the ozone hole began to form in mid August and was at its largest at around 21 million square kilometres from mid to late September. It is now around 18 million square kilometres in extent [The continent covers 14 million sq. km.]. This is larger than in 2012, but smaller than the average over the last decade. The area with temperatures colder than -78°C was around average until mid September, when it rapidly dropped, but has since returned to near average. Highest ozone values surround Antarctica at about 45 - 60°S in a horse-shoe between South America, Africa and Australia, with highest values above 420 DU south of the Indian Ocean. Lowest values, below 150 DU, are broadly over West Antarctica. 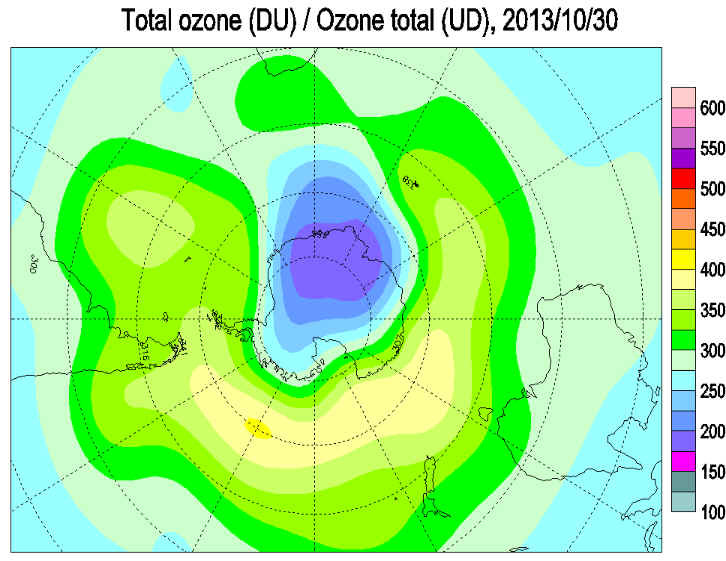 The 2013 ozone hole is near its maximum depth, though lowest values may still be set over the next week. 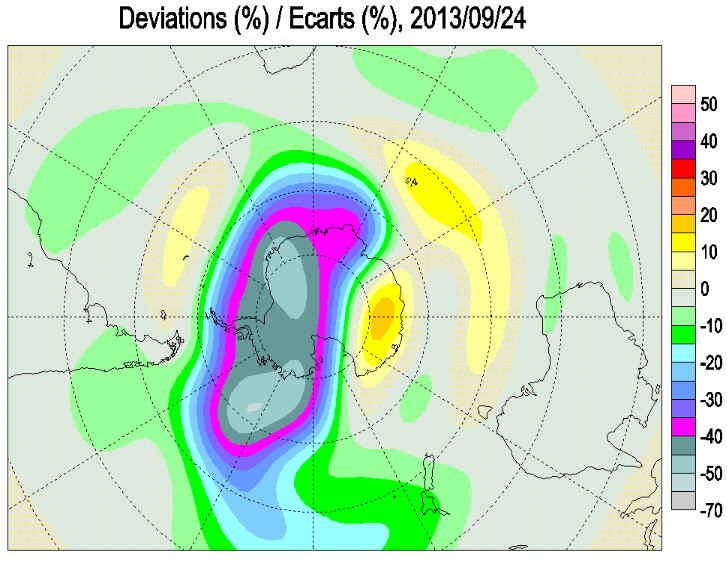 The edge of the ozone hole briefly touched the tip of South America on September 16. On occasion atmospheric vertical motions create small areas with ozone substantially below the long term average. Different satellites give different views of the exact ozone distribution. The lower ozone layer remains near its winter temperature, but is beginning to warm. It was significantly cooler than the long term mean until late August. Polar Stratospheric Clouds (PSCs) are still forming within the polar vortex. On a few days in early August and again in mid September new record minima were set. The 2013 winter polar vortex is near its largest and has generally been a little larger than the average over the last decade. It remains quite stable. According to NOAA SBUV measurements the ozone hole began to form in mid August and is now around 20 million square kilometres in extent [The continent covers 14 million sq. km.]. This is larger than in 2012, but smaller than the average over the last decade. The area with temperatures colder than -78°C was around average until mid September, when it rapidly dropped. Highest ozone values surround Antarctica at about 45 - 60°S in a horse-shoe between South America, Africa and Australia, with highest values above 430 DU south of the Indian Ocean. Lowest values, below 150 DU, are broadly over West Antarctica. 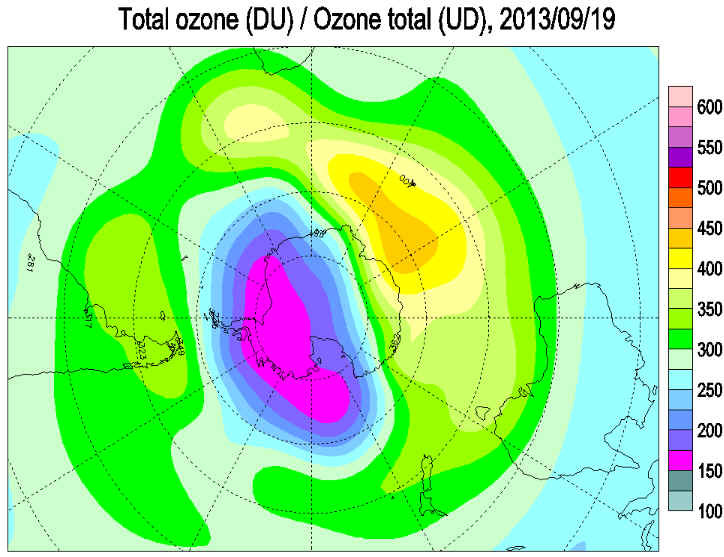 The 2013 ozone hole is nearing its maximum depth and size, with lowest values likely to be set over the next week. 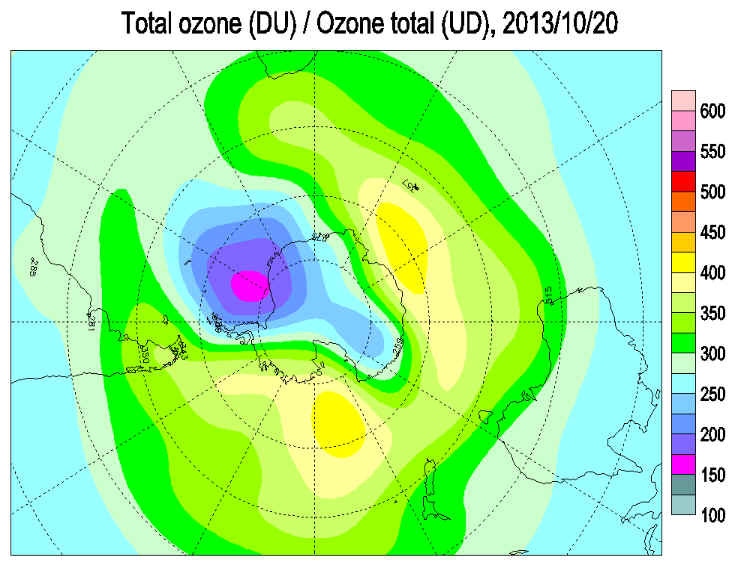 The edge of the ozone hole briefly touched the tip of South America on September 16. On occasion atmospheric vertical motions create small areas with ozone substantially below the long term average. Different satellites give different views of the exact ozone distribution. September 20, 2013-Jonathan Shanklin of The British Antarctic Survey reports that the 2013 winter polar vortex is near its largest and has generally been a little larger than the average over the last decade. According to NOAA SBUV measurements the ozone hole began to form in mid August and is now around 19 million square kilometres in extent . Roughly the area of the United States, Canada and Mexico combined This is larger than in 2012. Below is a table of geographic areas to be used as references in conceptualizing just how large the ozone hole can get. 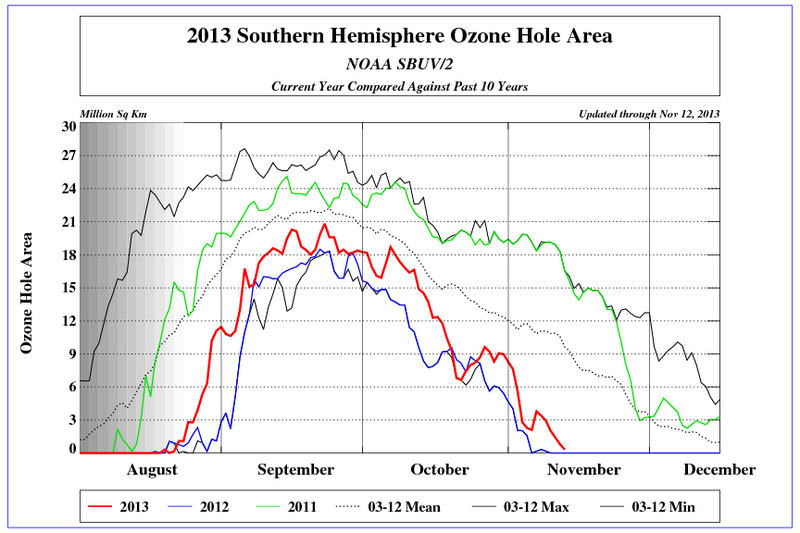 The 2013 ozone hole is nearing its maximum depth and size. The ozone layer is at its winter temperature, and was significantly cooler than the long term mean until late August. It is beginning to warm, but Polar Stratospheric Clouds (PSCs) are still forming within the polar vortex. On a few days in early August and again in mid September new record minima were set. The 2013 winter polar vortex is near its largest and has generally been a little larger than the average over the last decade. It remains quite stable. According to NOAA SBUV measurements the ozone hole began to form in mid August and is now around 19 million square kilometres in extent [The continent covers 14 million sq. km.]. This is larger than in 2012, but smaller than the average over the last decade. The area with temperatures colder than -78°C is around average. Highest ozone values surround Antarctica at about 45 - 60°S in a horse-shoe between South America, Africa and Australia, with highest values above 430 DU south of the Indian Ocean. 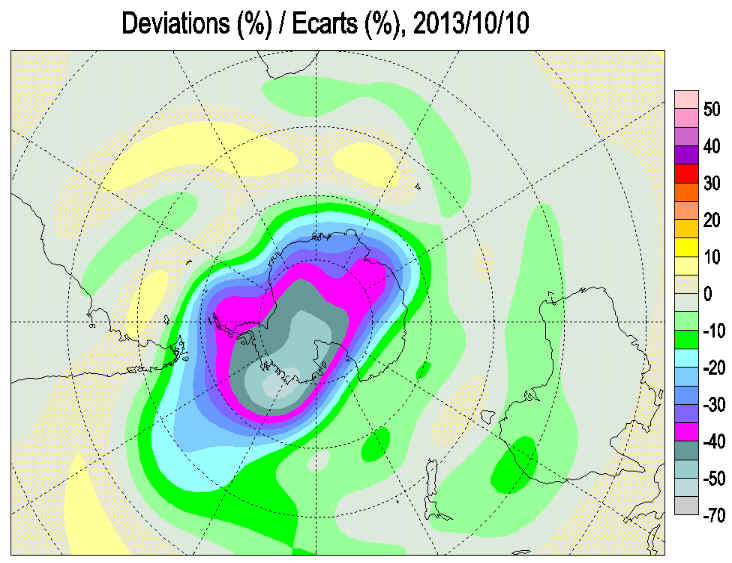 Lowest values, below 150 DU, are broadly over the base of the Antarctic Peninsula. 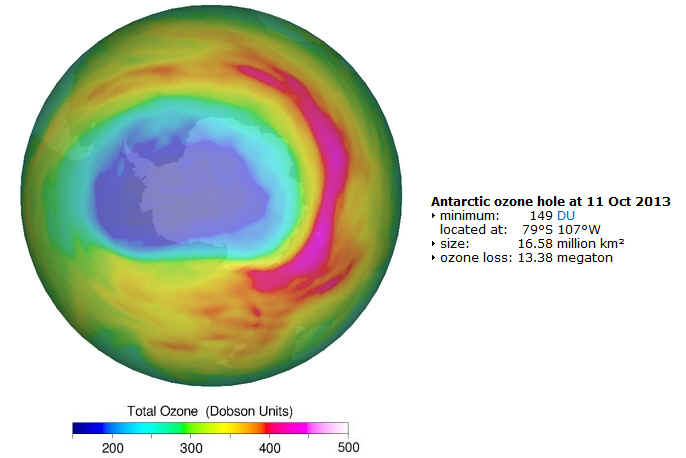 The 2013 ozone hole is nearing its maximum depth and size. On occasion atmospheric vertical motions create small areas with ozone substantially below the long term average. The ozone layer is at its winter temperature, and was significantly cooler than the long term mean until late August. It is beginning to warm, but Polar Stratospheric Clouds (PSCs) are still forming. On a few days in early August and again in mid September new record minima were set. The 2013 winter polar vortex is near its largest and was a little larger than the average over the last decade until the end of July. It is now around average in size and remains quite stable, though the top of the ozone layer is beginning to warm. According to NOAA SBUV measurements the ozone hole began to form in mid August and is now around 19 million square kilometres in extent [The continent is 14 million sq. km.]. This is larger than in 2012, but smaller than the average over the last decade. The area with temperatures colder than -78°C is around average. 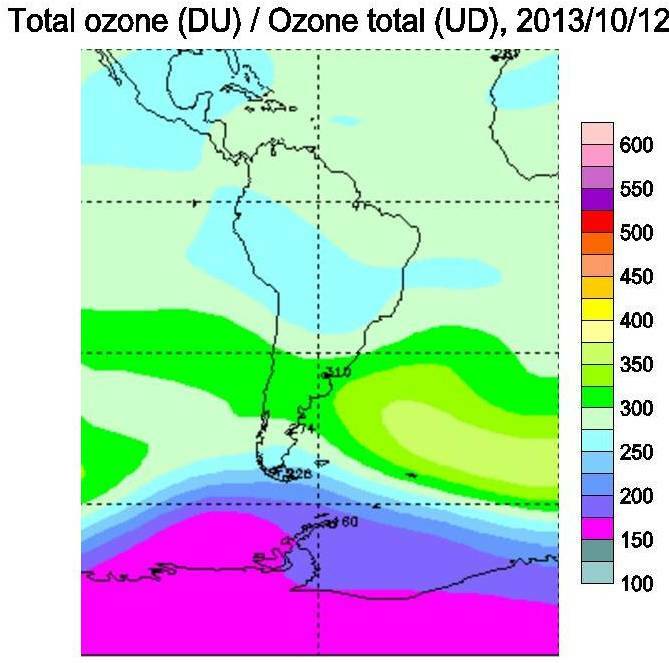 Highest ozone values surround Antarctica at about 45 - 60°S, with peak values above 400 DU in a horse-shoe between South America, Africa and Australia. Lowest values, below 150 DU, are over Coates Land. 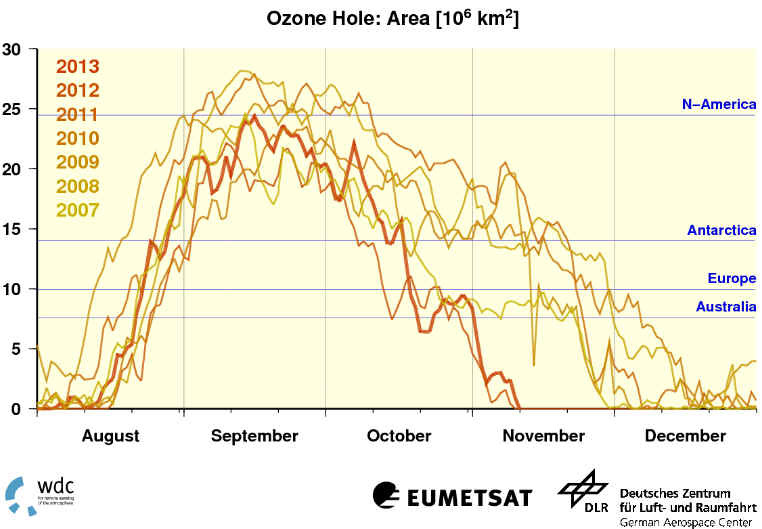 The 2013 ozone hole is nearing its maximum depth and size. On occasion atmospheric vertical motions create small areas with ozone substantially below the long term average. Different satellites give different views of the exact ozone distribution. The ozone layer is at its winter temperature, and was significantly cooler than the long term mean until late August. It is beginning to warm, but Polar Stratospheric Clouds (PSCs) are still forming. On a few days in early August new record minima were set. The 2013 winter polar vortex is near its largest and was a little larger than the average over the last decade until the end of July. It is now around average in size and remains quite stable, though the top of the ozone layer is beginning to warm. 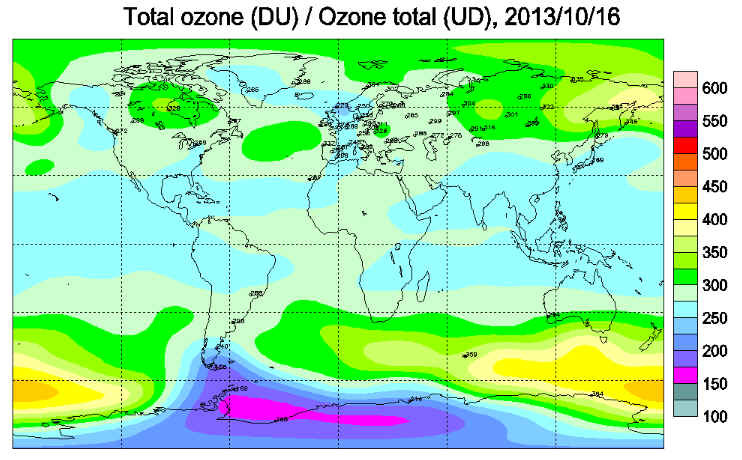 Highest ozone values surround Antarctica at about 45 - 60°S, with peak values above 400 DU between the continent and Australia. Lowest values, below 200 DU, are over Dronning Maud Land and the Bellingshausen Sea. 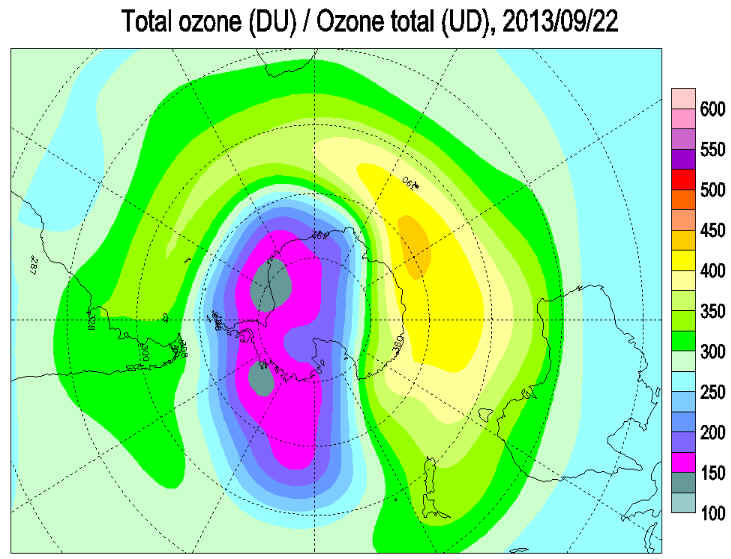 The 2013 ozone hole is underway. On occasion atmospheric vertical motions create small areas with ozone substantially below the long term average. Different satellites give different views of the exact ozone distribution. The ozone layer is at its winter temperature, and was significantly below the long term mean until late August. Polar Stratospheric Clouds (PSCs) are forming. On a few days in early August new record minima were set. The 2013 winter polar vortex is near its largest and was a little larger than the average over the last decade until the end of July. It is now around average in size and remains quite stable, though is beginning to warm at the top of the ozone layer. Highest ozone values above 400 DU surround Antarctica at about 45 - 60°S and lowest values below 220 DU are over Dronning Maud Land. 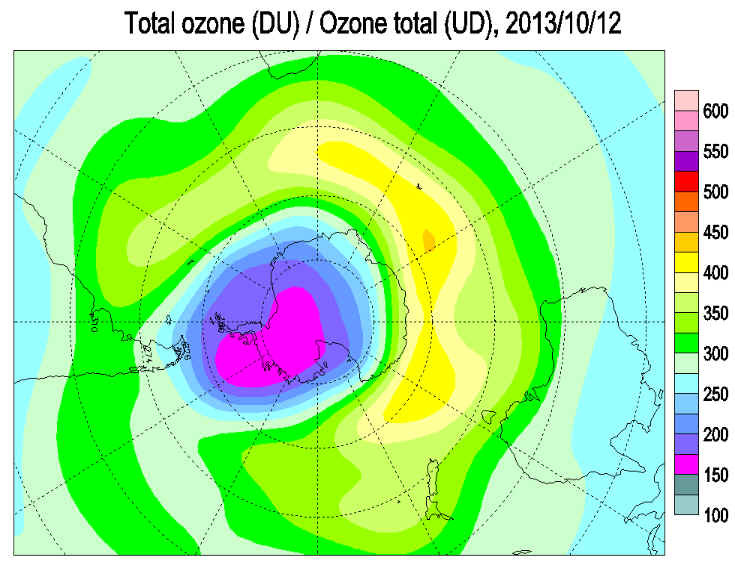 The 2013 ozone hole is underway. On occasion atmospheric vertical motions create small areas with ozone substantially below the long term average. The ozone layer is at its winter temperature, but significantly below the long term mean, and Polar Stratospheric Clouds (PSCs) are forming. On a few days in early August new record minimum were set. The 2013 winter polar vortex is growing and was a little larger than the average over the last decade until the end of July. It is now around average in size. 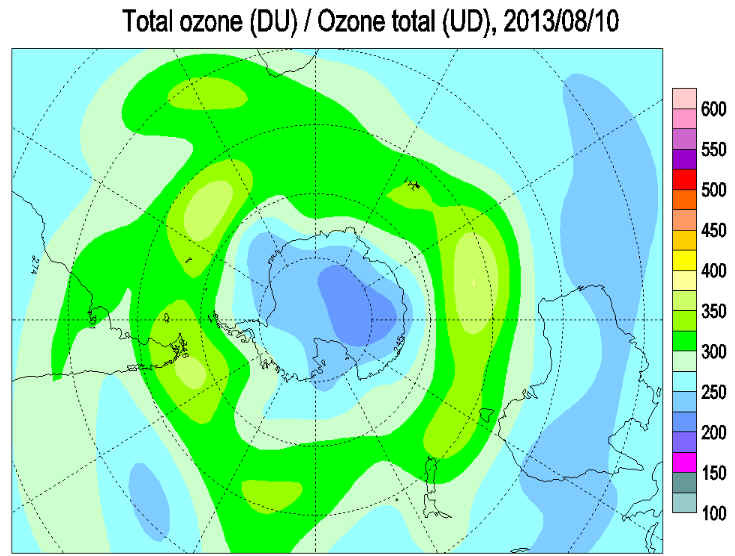 Ozone distribution is becoming organised, with highest values up to around 400 DU surrounding Antarctica at about 45 - 60°S and lowest values at around 220 DU over the continent. 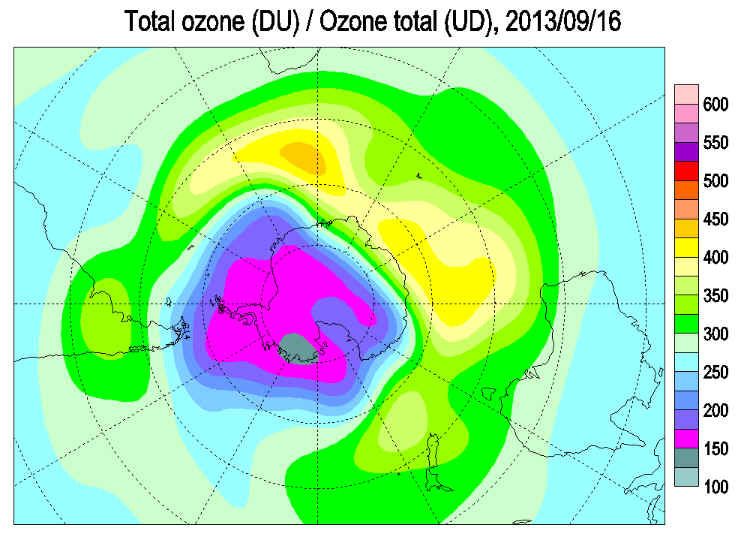 The 2013 ozone hole is being created. On occasion atmospheric vertical motions create small areas with ozone substantially below the long term average. Different satellites give different views of the exact ozone distribution. The ozone layer is at its winter temperature, though a few degrees below the long term mean, and Polar Stratospheric Clouds (PSCs) are forming. The 2013 winter polar vortex is growing and is a little larger than the average over the last decade. 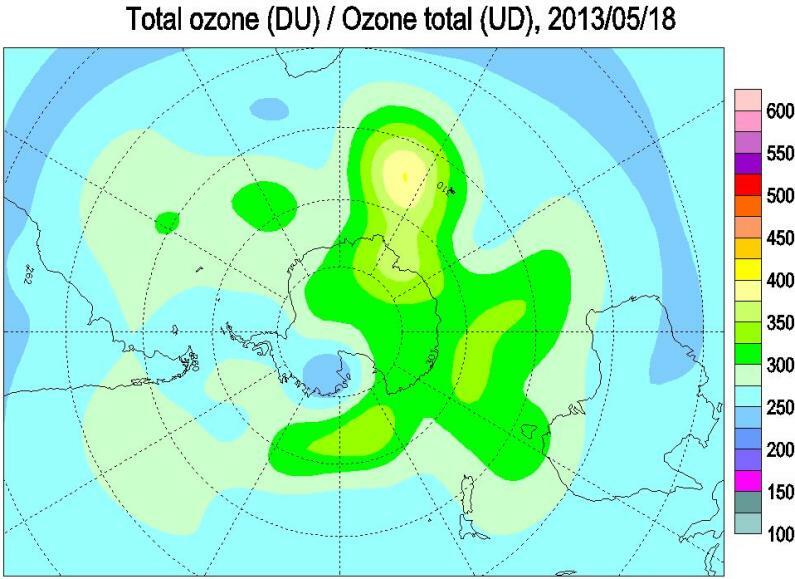 Ozone distribution is beginning to organise, with highest values up to around 370 DU surrounding Antarctica at about 45 - 60°S and lowest values at around 220 DU over the continent. 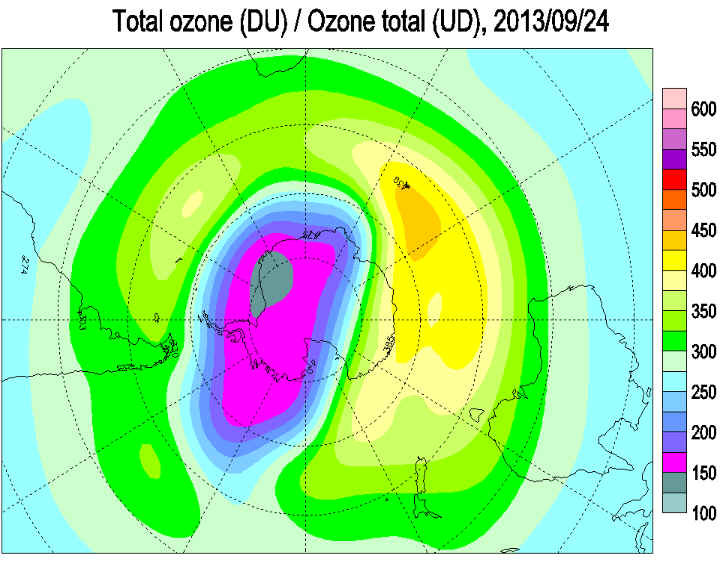 The 2013 ozone hole is beginning to be created. On occasion atmospheric vertical motions create small areas with ozone substantially below the long term average. The ozone layer is near its winter temperature, though a few degrees below the long term mean, and Polar Stratospheric Clouds (PSCs) are forming. The 2013 winter polar vortex is growing. 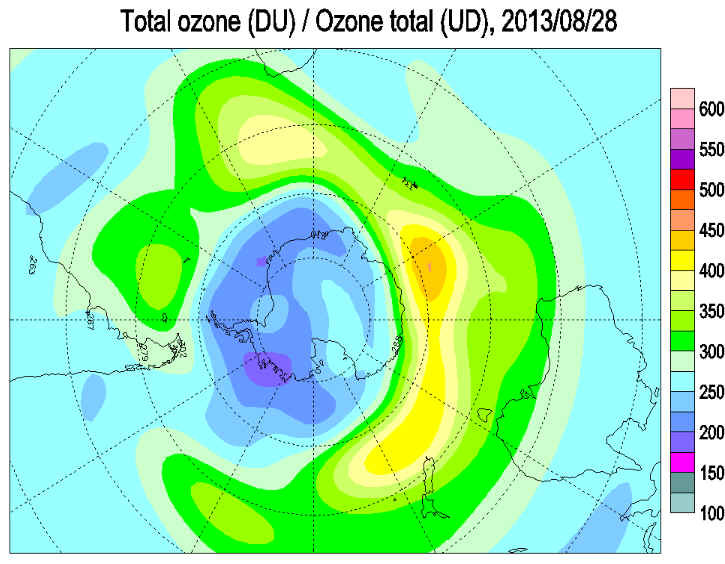 Ozone distribution is beginning to organise, with highest values at around 375 DU surrounding Antarctica at about 50 - 60°S and lowest values at around 230 DU over the continent. 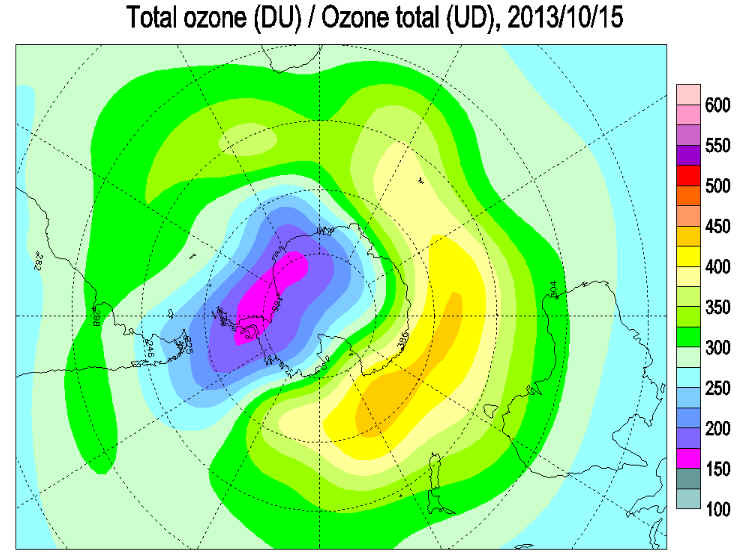 The 2013 ozone hole is beginning to be created. 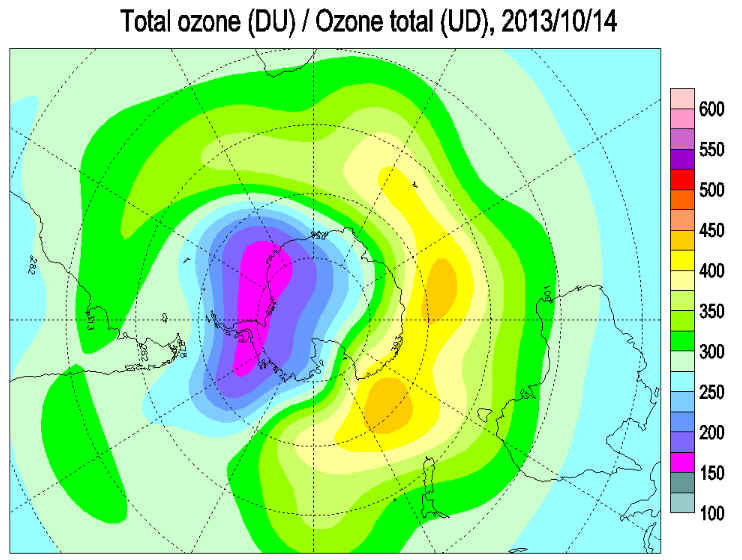 The ozone layer is cooling with the 2013 winter polar vortex forming, and it is cold enough for PSC formation. 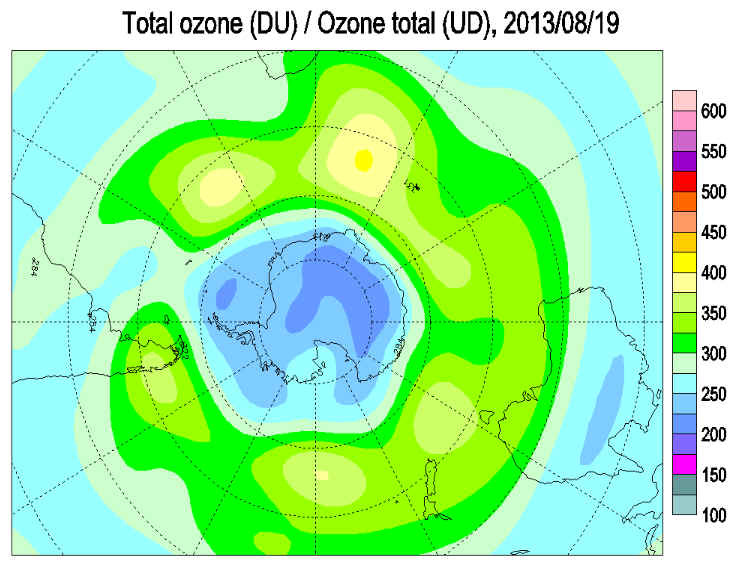 Ozone distribution is beginning to organise, with highest values at around 360 DU surrounding Antarctica at about 50 - 60°S and lowest values at around 260 DU over the continental margins. 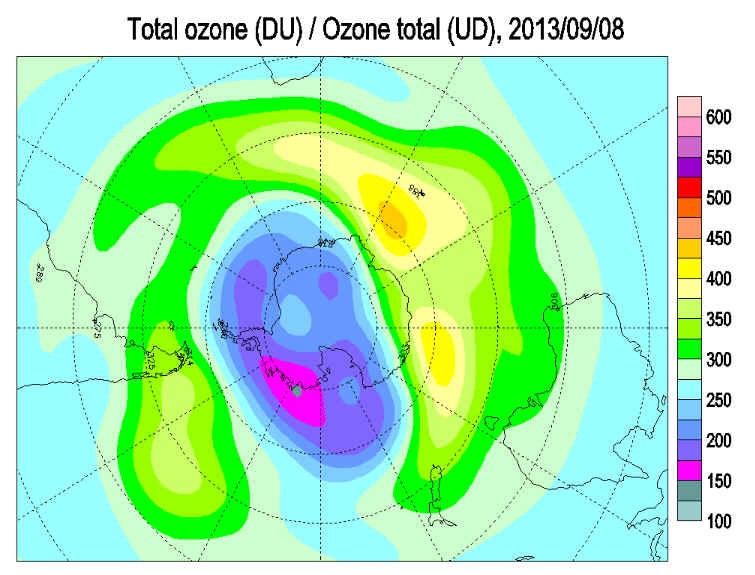 The 2013 ozone hole is beginning to be created. 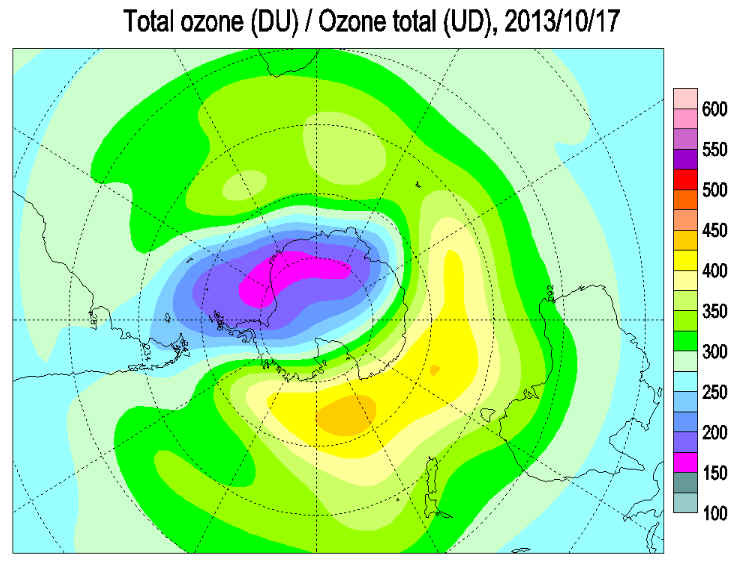 The 2012 ozone hole is long over and the 2012 winter polar vortex over Antarctica has dissipated. Ozone distribution is rather patchy with lowest values at around 240 DU over the Weddell Sea and highest values at around 350 DU surrounding Antarctica. The ozone layer is now cooling with the 2013 winter polar vortex forming, and it is cold enough for PSC formation, so the 2013 ozone hole is beginning to be created. 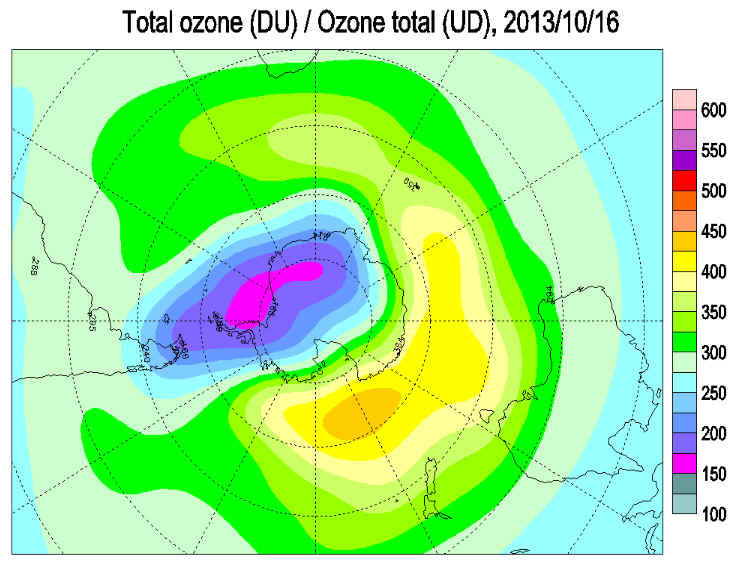 The 2012 ozone hole is long over and the 2012 winter polar vortex over Antarctica has dissipated. 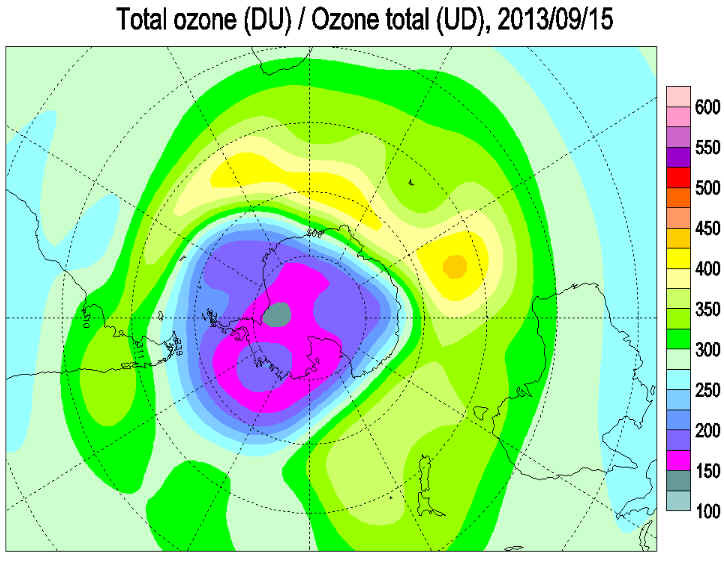 Ozone distribution is rather patchy with lowest values at around 280 DU and highest values at around 330 DU. The ozone layer is now cooling with the 2013 winter polar vortex forming, and it is nearly cold enough for PSC formation. Different satellites give different views of the exact ozone distribution. The 2012 ozone hole is over and the 2012 winter polar vortex over Antarctica has dissipated. 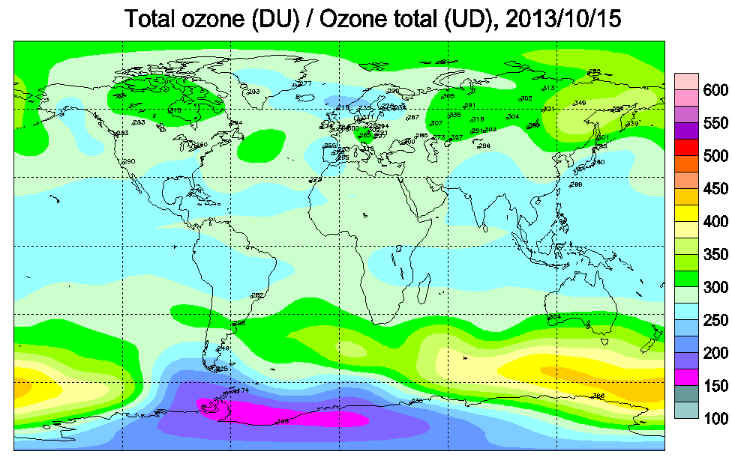 Ozone distribution is rather patchy with lowest values at around 260 DU and highest values at around 340 DU. Values over the continent are generally near the autumn minimum. The ozone layer is now cooling and the 2013 winter polar vortex is forming, though it is not yet cold enough for PSC formation. Different satellites give different views of the exact ozone distribution.